Click on the picture to embiggen! Here's a mini tutorial for how I did it (be prepared to be impressed...not!!). Anyhoo....first I covered the book with some heavy brown paper (recycled from a grocery bag), glued down with a coat of Mod Podge I had lurking in my stash for what seems like forever. Big surprise was that it wasn't all dried up. I marked out the spine area and covered that with little torn strips of masking tape. The 'stamps' were cut from a vintage stamp collectors album (thanks Liz!!). Another slathering of Mod Podge and I collaged the stamps onto the rest of the cover (front & back of the book). After drying time on the balcony in the sun, I scrounged through my stash and came up with an eons-old bottle of water based walnut wood stain....slathered that on, and back into the sun to dry. A coat or two of waterbase varnish and voila.....a new everyday sketchbook for moi!! Here's a little felted bag. notes onto it and it's now DONE!! Pattern is 'Two Measures of Joy"
I am very sad to say that the formal lessons have ended for the Embroiderer's Ledger online class. Will I miss it? No question! Would I strongly recommend taking this class? Oh yeah!! Do I have ideas to carry on? Definitely. Clicking on them will embiggen them so you can see the details. (and being downright fun to know!). Some of the more eagle-eyed of you might have noticed that I have done a big update of my link list (look to your left). Please visit any and all of them and say hi. Sorry that it isn't a great picture tho'!! The light just didn't want to cooperate. If you click on it, hopefully it will be clearer. from our friend on the weekend. It was a complete surprise and isn't it great? 1. 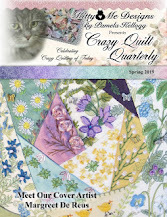 The newest issue of Pat Winter's 'Crazy Quilt Gatherings' magazine is now available HERE. Needless to say I have ordered my copy already! 2. Remember me sending you over to see the installation that Susan Lenz did? Well there are more detailed pictures HERE in this post. Be sure to scroll down to see all the details! How I wish I could see this in person!! 3. Kathy Shaw is one of the generous souls on the internet and she has posted a free Silk Ribbon Embroidery Basics download. 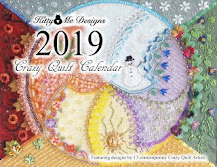 Kathy always has something interesting on her blog and also has published a book called 'Embellishing Crazy Quilts' and, of course, you know I have a copy! Anyway, go HERE for the SRE Basics information. 4. And....I'm sending you back to Kathy's blog again so you can see THIS. If you like white and embroidery, go drool!! Careful, don't drip on your keyboard! 5. Last, but not least, I know I've directed you before to have a look at Evy's blog. This time she not only has some beautiful pictures (very drool-worthy!) but she also has some beautiful free images for us at the bottom of THIS post. There's a 'translate' button her blog if you need it. Well folks, there's no real pictures of stitching today and when I do show you these photos you will understand why!! space for my new printer!! They're done on fabric, trapuntoed, and then painted. I had some really shiny 'goo' that went over top to hopefully reflect the glaze that is on a 'real' cup and saucer. but it's actually a laser printer. ink cartridges for my old printer. but the ink was beyond belief. I even installed it all by my own widdle self!!! - Sally Mavor has posted a photo of her latest creations and it's a WOW! Go HERE to see. - if you are interested in embroidery patterns of the free sort, there's a great group on Flickr HERE. You will need to join the group to access the patterns but there are absolutely oodles of them! - Art Chix Studio, which is a Canadian company, always has fun and interesting things on offer, but these have definitely caught my eye. Aren't they cute? .... I'm an embroidery book junkie! Sites - for sore eyes? I'm sorry to say that once again there are no photos to share. Rest assured, I'm stitching merrily away and in the next day (or maybe two) I should have something to show for my efforts. - Susan Lenz does some pretty incredible art and her latest installation is absolutely eye popping! If you like textiles and recycling you have to see it HERE. Be sure to click on her pictures to enlarge them! - Are you looking for a really innovative way to store your fabrics? Go HERE and check out what SewManyWays has to show us. - The fibre art that appears on Mr. Finch's site is always interesting and his latest series of moths is pretty sweet. I wouldn't mind having one of these on my wall! Go HERE and be sure to scroll down to see his other creations. - and finally, Adele Sciortino has announced a number of new on-line doll making classes HERE. Fishing, so the mice played! I can't thank Karen enough for this class! a lot of fun at the same time! the appalling mess on the bottom left! Today I've been hobbling about - muttering about how dumb I can be. This morning I managed to wrap my toe around a box full of books and .... guess what?.....boxes of books don't move, and toes? Well, mine is black and my whole foot is swollen. Hmmm.....wonder how many times I'm going to whack it again before it heals? I've been happily stitching, but can't show you - yet! I haven't opened it yet because I'm saving it until I can sit down and have a delightful read. This book is by Sue Bleiweiss who I've followed online for some time. Along with her own blog HERE, she also runs the Sketchbook Challenge blog HERE. I have long been intimidated by sketchbooks because I didn't know quite what to do with one. Taking Karen's 'An Embroiderer's Ledger' online class has started me on what I hope will be a fruitful journey into sketchbook-ing. About birds? Well, I just stumbled across some of the cutest little embroidered ones that Catherine Frere-Smith has done. Go HERE (scroll down to see her delightful little creations!). And eyes? There's definitely embroidered 'eye' candy brooches at Sylvia's Windy River Beadwork and Embroidery site HERE. 1. What long weekend in the summer would be complete without having burgers on the barbie? Well, go HERE for a great low-calorie burger you are sure to love! 2. Trish Burr has done a most interesting interview with Di van Niekerk (silk ribbon embroiderer). There is some lovely silk ribbon eye candy HERE along with the interview. While you're there be sure to have a peek at Trish Burr's gallery too. Be prepared to be wowed with her needlework skill! 3. Connie often has some great links to organizational blogs and this time she has done something herself that I just love and would copy her idea in a heartbeat if I had the room for it. Go HERE ! First of all, I would like to point you towards a sweet tutorial on Di van Niekerk's site for silk ribbon embroidery roses. Go HERE. I love the little birds nest too!! Another page for my ledger class! Clicking on it should embiggen it so you can see it better. Sorry about the poor quality photo - it's too late in the day and I had to use artificial lights.